High-quality, extruded upper receiver comes in A3 flattop configuration that offers plenty of flexibility in both open and optical sighting options. MIL-STD 1913 Picatinny rail has 17 cross-slots that accept popular AR-15/M16 accessories and scope mounts. Shell deflector and forward assist are machined as a single unit. 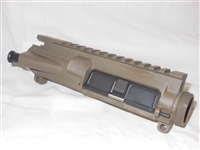 Stripped upper is receiver only. Ejection port machined extra wide for the .458 Socom and other large bore calibers. Barrel : This 416R Stainless Steel barrel is chambered in 5.56 NATO with a 1:7" twist, M4 barrel extension, and a mid-length gas system. It is finished off with classic mid-length handguards, an F-marked Front Sight Base, and an A2 Flash Hider. Upper : The forged 7075-T6 A3 AR upper is machined to MIL-SPECS and hard coat anodized. These uppers are made for us right here in the USA by a mil-spec manufacturer. Does include bolt carrier group and charging handle. When the situation demands fast shooting, a big scope with a narrow field of view just won't cut it CHOOSE THE StrikeFire red dot and shoot with both eyes open. With unlimited field of view and eye relief, nothing gets you on target faster than this tough, compact red dot sight. Optic has option for both RED/Green Dots. •High recoil caliber rating—tested with .375 H&H Magnum for 1000 rounds. •Included extra-high 30mm ring puts scope's bore center 37 mm (1.46 inches) above the base height. Commonly used for mounting with a top AR15, providing lower 1/3 co-witness with iron sights. Bolt is made of Mil-spec Carpenter 158 steel, Gas key is SECURED with grade 8 fasteners and staked per mil-spec. 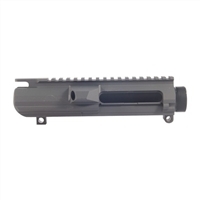 These stripped, fully-forged upper receivers are CNC machined from a solid 7075 T-6 aluminum billet. Features include an integrated Picatinny rail with T-marks, forward assist housing, and a black anodized finish. Without M4 feed ramp cuts.